Description: INES is the reference center in France, and one of the first in Europe, dedicated to research, inno-vation and training on solar energy. Set up with the support of the Savoie Departmental Council and Rhône-Alpes Regional Council, it hosts teams from the CEA and the University of Savoie, and is supported by the CNRS and the CSTB. INES currently employs 300 staff, a figure that will rise to 500 engineers and scientists, on a 22,000-m² site equipped with state-of-the-art facilities. The research teams of INES investigate all aspects of solar photovoltaic energy – silicon materials, cells, modules, systems, electricity storage, demonstrations and tests. The institute’s scientists are currently studying methods for producing solar-quality silicon metal, increasing the efficiency of solar cells and developing storage systems for innovative forms of energy. In the field of solar thermal, R&D will be carried out to optimize existing products and to adapt these products according to their usage or the complementary energy used (wood, gas, etc.). Other research fields include the development of combined systems (hot water and heating) and solar climate control. Building-integrated solar energy and the active management of combined thermal and electrical sources are also major research streams for INES, whose objective is to develop “positive energy” technologies that produce more energy than they consume. INES is also carrying out important research into solar mobility. The heart of the infrastructure is the hardware in the loop simulator which allows the simulation of any complex grid situation and which transforms a specific grid points into reality with the use of 45kVA three phase power stages. This can be used to test specific components and the different control and management strategies. The hardware in the loop simulator is integrated in the multi microgrid platform PRISMES, which covers the complete campus of INES. Single phase and triple phase grids are available at the platform, which are completely independent allowing running different projects in parallel. The labs cover a range of 18 – 125 kVA. Description: France has the willingness to encourage BIPV installations with a specific feed-in tariff set at 0.60 €/kWh. At CEA-INES, the research activity on BIPV is growing rapidly. Our research activities are to develop methods to determine the BIPV performance and also to develop innovative BIPV products. Description: Façade element including BIPV elements which have a strong interaction with the building. Description: 2 * 5 channels for long term inverter performance tests with real PV-modules, in two different climates. Description: INES, the French national institute for solar energy, results from the gathering of most of the French research actors in the field of solar energy. The INES/L2S team deals with the development of innovations in the field of photovoltaic components and systems. Description: Characterization of PV in outdoor conditions under two different climates. Each test bench is able to monitor 24 modules. IV-curves are scanned every 5 minutes and contain about 100 points. At the same time, temperature of the module at the backside, ambient temperature, irradiance in the plane of the modules measured by pyranometer and reference cell, and some other weather data are measured. Description: Determination of the IV-curve under nominal operation conditions for module sizes up to 1,5m x 1,5m. Description: Outdoor evaluation of energy rating of PV modules. Continuous scanning of I/V curves. Compatible with the Varaible Illumination Measurement (VIM) method, which allows for determination of the equivalent circuit parameters, and for the precise monitoring of module degradation. Each setup monitors 24 modules. Available in two different climates. Other climates (desert, high alps, etc.) under construction. 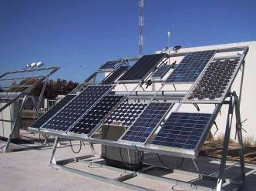 Description: Outdoor evaluation of energy rating of PV modules. 12 real size test systems with performance monitoring. Description: The INES/module team deals with the development of innovations in the field of photovoltaic components and systems. Description: Module (max): 1,7 x 1,37m; Thickness: max 20 mm; Module weight (max): 100 kg; Encapsulation: EVA (fast) / PVB / TPU; Configuration: Glass / Tedlar or Glass / Glass. Description: Wafers positions XY accuracy: ±0,2 mm; Connection bands XY accuracy: ±0,2 mm; Gap between two wafers: Min 0,2 mm, Max 3 mm. Description: PRISMES consists of a LV microgrid, including several generators with different technologies (renewable and conventional), controllable loads, electrical vehicles and storage systems. PRISMES can provide electricity to the main grid and is supervised. The availability of a real time simulator allows to test advanced inverter concepts. PRISMES allows to integrate PV generators, stationary storage, and energy management systems to validate smart grid integration concepts for electric vehicles. A centralised supervision system is visible in a control room, demonstrating the operation of the vehicle charging platform andthe aggregation of energy management systems. 160kW PV are available for PRISMES. There is also a solar charging station located at CEA in Grenoble, and both facilities enable technology development and demonstration for industrial partners. Description: To have a better sensitivity in barrier measurements, the LCS laboratory patented an apparatus combining mass spectrometer detection and isotope labelling in order to be able to measure permeation levels as low as 10-5 g/m².d for H2O (and 10-3 cm3/m².d for O2) with accuracy, and with a high degree of confidence. Description: A climatic chamber to measure OPV parameters in a controlled atmosphere (temperature and humidity) is available. Range of T°C : -40°C to 180°C; Range of relative hygrometry : 10% to 98%; Cycle capabilities; Solar simulator integrated (AM 1.5, 1000 W/m²); Window of irradiation : 50 x 60 cm; Volume 340 liters. Description: The experimental STORE facility is used to characterise the performance and aging of a range of electricity storage technologies, mainly electrochemical. It is the largest facility in Europe for the study of renewable energy storage and distributed electricity generation. The facilities provided by STORE may also be used in other energy storage applications such as electric vehicles. The tests normally involve a sequence of charge- discharge cycles with controlled profiles and temperatures. The protocols used depend on the target application and the conditions under which the energy storage system is to be used (independent or grid connected photovoltaic system, electric vehicle, etc.). Description: INES can propose, with the SUSI platform, facilities focused on crystallisation and wafer processing, as well as Silicon characterisation. Description: Characterization equipment, ppb resolution for B, P and metallic elements analysis in Si feedstock. Description: Crystallisation equipment with a radial induction coil and a heat extraction by conduction. Description: Cristalisation equipment fully instrumented with gas analysis, high temperature endoscopic visualisation, variation of partial pressure atmosphere, and both heat extraction by conduction and from radiation. The crucible size of maximum 60kg allow the production of 4 bricks of 156*156 mm2. Quality Management: All laboratories are certified according to ISO9001:2008.